WARNING: This culinary article may make some readers squeamish. To be fair, my eating of strange things predated my French Years. I did eat squirrel when I was a child. On several occasions. My father was a hunter, and we ate what he shot: rabbit, pheasant, duck, deer... Don’t ask me why he shot squirrels, but yes, they do have a faint nutty taste. But squirrels aside, it may all have started in Paris on a tour of Europe with my parents when I was 12. My father devised a three-week swing through six countries and if a tire had blown at any time, our entire schedule would have been wrecked, that’s how tight he had things planned. But we did have a few days in Paris. Probably two. We stayed in a tiny pension (kind of a boarding house) off the Champs-Elysées. I don’t remember much, but I remember the Arc de Triomphe and that we had to get there by walking across the star-shaped intersection through whirring cars - no stoplights then and definitely no underpass. But an elderly woman was doing it, so we just walked behind her... and prayed. 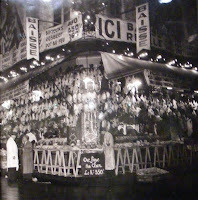 I remember one day eating at one of the restaurants on the Champs and my father ordered escargots - snails - so I did, too. My mother wrinkled her nose and concentrated on her salad. The escargots were a bit rubbery, but had no taste of their own, really. Just the taste of lovely butter and parsley and garlic, which I have learned is the way God intended them to be eaten. In the period A.E. (After Europe), there were other things I tried. There were frog’s legs - cuisses de grenouille - which my father received on a fairly regular basis, for medical services rendered (a throwback to the pay-with-a-chicken of yesteryear). They taste surprisingly like snails, consistency aside, because of the butter-garlic-parsley preparation that is the same. And there was tortoise soup, ubiquitous in the 60's but since banned, I think, because tortoises are on the endangered species list. And of course ris de veau, which I never would have eaten if I’d known that it was the thymus gland of some poor calf. It loses in the translation somehow. 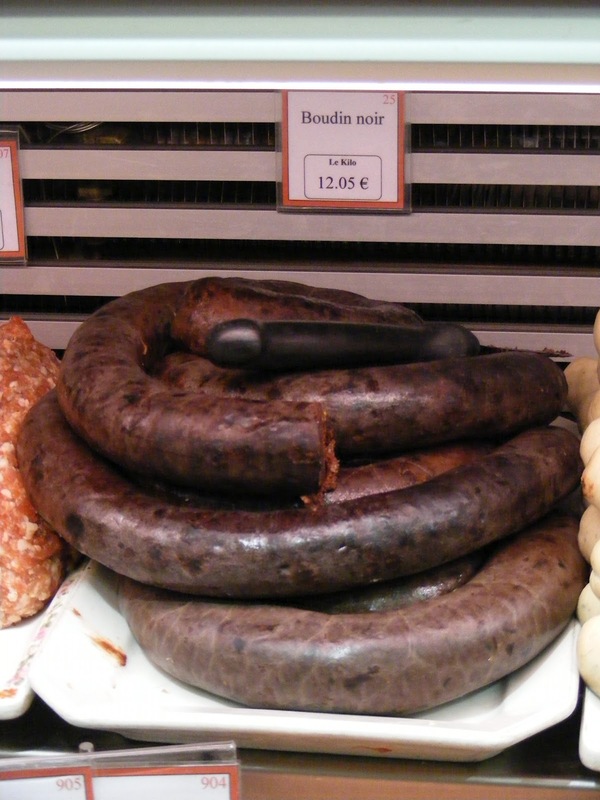 And that reminds me of boudin. Which would be blutwurst if you were German. 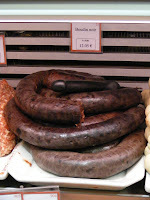 I had my first close encounter with boudin while on a trip to Brittany with my then-beau Yannick, who was from there. 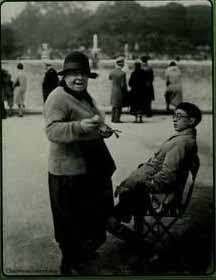 He took me to Beg Léguer, a tiny seacoast town near Lannion where he’d spent his summers as a boy. It was Easter and it wasn’t exactly warm. The campgrounds were closed but there was a light in the snack bar and the lady remembered Yannick, his blue eyes and his lopsided smile. So she agreed to cook us up something. We were the only people there. "What do you want to eat?" she asked us... and he turned to me. "Well... something regional?" I questioned. She immediately said "Ca, c’est le boudin. Aux deux pommes." Translation: That would be boudin with two types of apples (meaning regular apples, sliced and caramelized, and mashed "apples of the earth", aka potatoes). "Do you want to know what that is?" Yannick asked me, with a note of apprehension in his voice. "Not if you have to ask. Tell me afterward." Afterward he told me what it was: blood sausage. My stomach went queasy for a few minutes, but I had to admit it had been tasty, fried all crisp with the melt-in-your-mouth apples and butter-rich mashed potatoes. Since then, I’ve branched out to boudin créole because my children’s father comes from the French West Indies. Same principle as French boudin, except tied into finger-food size sausages and jazzed up with hot chili peppers. You can get them in New Orleans and elsewhere in Louisiana, which was, after all, part of France until 1803 and remained a port that traded with the entire West Indies. In the realm of seafood, I’m pretty unbeatable, having been brought up at "the Shore" as people say in New Jersey - the pretty part, far from New York City. 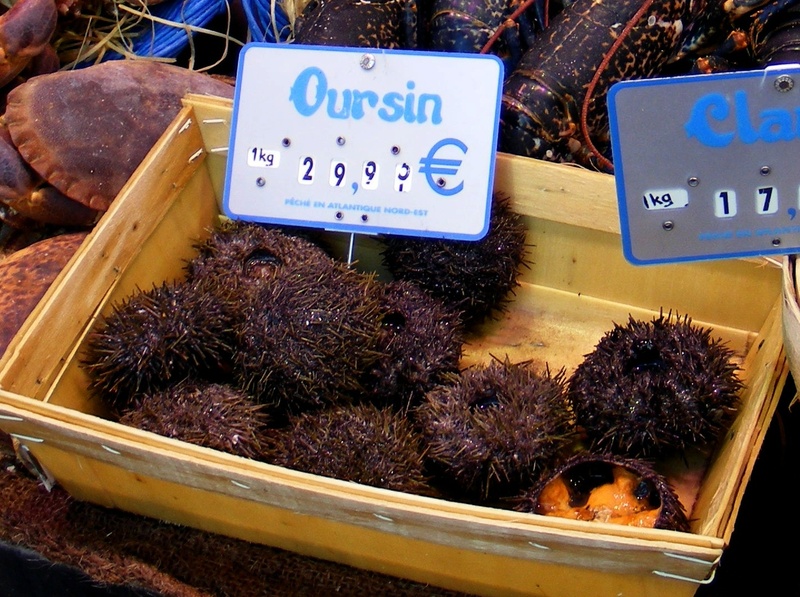 So sea urchins (oursins), strange-looking as they may be, are a salty treat. A kind of saltwater caviar, as it were. I have eaten beef tongue (langue de boeuf), which I’ve only had cut up in a salad. It’s not half bad, but I don’t think I’d go as far as the British, who eat it sliced in sandwiches... with a lot of mustard, I think. 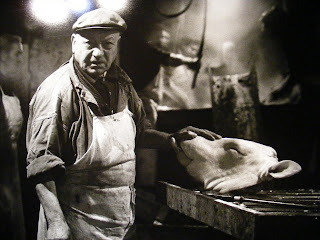 And I definitely don’t want to see it lolling about in the butcher’s window. I guess you either have to get used to certain foods when you’re young - before you truly understand what it is you’re eating - or you have to be more intrepid (or more curious) than I am. Still, I feel I’ve come a long way, baby. And I’m fine with the distance covered. As I was working on The Project (see Jan. 22), I ran across several books that I didn’t remember I had. One was called "Les petits métiers des jardins publics" and another called "Des métiers et des hommes au village". They reminded me of yet another book, "Les métiers disparus" (references listed below). The common thread in these books is jobs that have disappeared. There are plenty of them in the States, such as buggy whip maker. But in France I’m out of my native culture so maybe I notice these things more. If you weren’t too absorbed in a) your book, b) your lunch, or c) your boyfriend/girlfriend, you’d see her coming and nonchalantly get up and walk slowly and absent-mindedly in the opposite direction, maybe humming a tune, or saying loudly something like "Zut! J’ai perdu mon...." (Rats! I lost my fill-in-the-blank. ), just so she wouldn’t think you were trying to be slick and escape without paying. As if they didn’t know. And then you’d find yourself a bench, which, unlike the chairs, was free. The chaisières were generally sour old bags with a nasty tone and a frown, which didn’t improve your opinion of them much. These women were paid a minimum wage, plus about 10% on the tickets sold. Which is probably why only needy old women would put up with the job of chasing after young students and smelly vagabonds. Only lovers paid her with a smile. The city of Paris bought the chairs in 1974, so they're free. These ladies have disappeared now. And we don’t miss them a bit. But I do miss the vitrier, the window repairman. I only had to use his services once, but was plenty glad to hear him yelling out "Viiiitrieeeeeeeeer" as he ambled up my street, a frame on his back, filled with panes of various sizes. Even oval ones for rarified ox-eye windows. He always seemed so vulnerable to me, such a perfect target for a nasty young boy with a slingshot and a good eye. You’d call down to him from your window, tell him what floor and await him on your doorstep. Vitriers were usually dressed rough and had some sort of regional, non-Parisian accent, plus a mustache and maybe a few days growth of stubble. They talked little, aside from "Where’s the window?" and set about their work as if they didn’t enjoy being indoors. 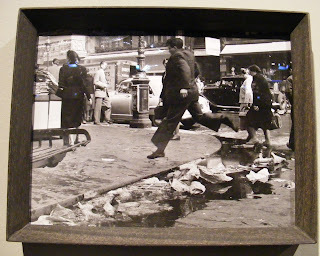 They cautiously removed the offending pane over a newspaper or rag that they kept for just that purpose, and then either handed the pieces to you for careful disposal or emptied them into a large box on their backpack-frame, probably to be sold for pennies to a scrap man who in turn sold them for a few more pennies to a glass company that melted them down to make new glass. Then the vitrier would measure your window and put in the right size, sometimes after trimming it down with his tools and snapping off the excess. He’d tap in those tiny nails to hold it in place, sculpt in the putty and then ask for his pittance. With a nod and a perfunctory tipping of his cap or beret, he’d be off and you’d soon hear him from your window taking up his song: Vitrier! Viiitrieeeeer! 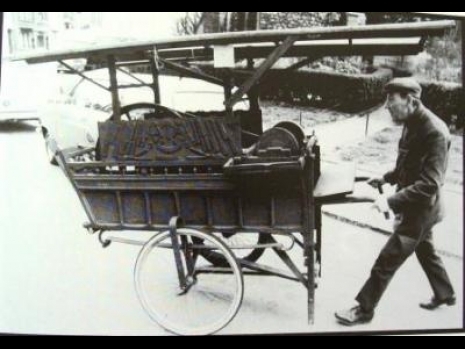 I also miss the knife-sharpener, who walked a lot faster... almost always too fast for me to catch. Back in the day, he must have been slowed up by all the homemakers who rushed downstairs, knives in hand. By the time I reached Montmartre in 1971, such homemakers were few and far between, I guess. As soon as you heard him swinging his bell in the distance, you rushed to gather up your dull knives, scurried down the stairs without impaling yourself and ran through the street after him. Again, I only managed this once. These aiguisseurs de couteaux didn’t do stairs. Of course they would have had a hard time, what with that huge grindstone-on-a-wheel they pushed down the cobblestoned streets. It made a bzzzzzz-ing sound and children liked to stop and watch the sparks fly, especially on cold days. The aiguisseurs were usually swarthy-looking, but they never yelled anything that would indicate their nationality. Just that swinging of the loud bell and bumping of the grindstone-wheelbarrow. One nationality you could recognize though was the gypsy who strode down the street accompanied by a young boy - or sometimes girl - rumbling a snare drum. He carried a stepladder over his shoulder, perched a capuchin monkey on his arm and led a llama (with two l’s, please) or a goat on a leash. 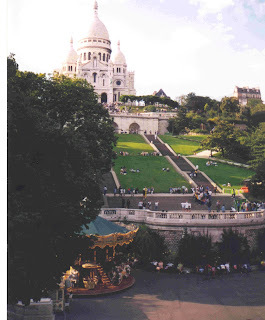 He would stop at a choice spot - which (lucky for me) was just below my window at the entrance to the park below the Sacré-Coeur - and the snare drum would sound a sharp, final rat-a-tat. He’d set up the stepladder, the young boy-or-girl would start a new drum roll, the llama (or goat) would dutifully climb up the three steps and then balance all four hooves on the top... or if it were feeling particularly inspired, lift one hoof and balance on only three. Whereupon the snare drum would break into a little dance rhythm, the monkey would doff his hat and the llama/goat would jump down with a sigh of relief. Then the child collected money from the crowd and the gypsy gave a morsel to both the llama/goat and the monkey and made a fuss over them, to keep them sweet. My children loved their act and would clap their little hands from our fifth-floor window. We would take a franc or two and wrap it in newspaper and yell to the child until (s)he looked up. Then we’d throw it out the window to the pavement, where it would be scooped up and handed, with the rest of the booty, to the gypsy, who put it in the red velvet money bag hanging from his waist. After that, the gypsy folded the stepladder, the monkey jumped up on his arm... and they were off, presumably to the next corner. Sometimes you could hear the drum routine two or three times before they disappeared from earshot. And from the streets of Paris, I guess, because I haven’t seen or heard one in almost two decades. Nowadays it's other métiers, other trades that are becoming rare. Stationery shops, for instance. 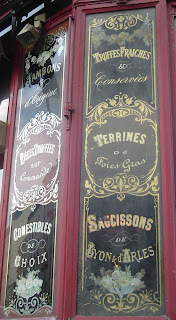 There used to be a large one just across from the Abbesses Métro station in my neighborhood. It sold newspapers and magazines, both domestic and international, to us all, along with books, maps, paper, pencils and other office/school materials. Plus it had a Xerox machine that worked full-time... when it wasn’t broken. 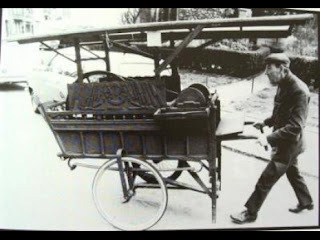 The gentleman who owned it was in a wheelchair and often surly, but rarely to me, whom he would tease mercilessly, a little quirky smile on one side of his face. On one of my stays here I didn’t see him and presumed he was off on vacation or ill or something. The next trip I still didn’t see him and asked after him. Whereupon I learned that he had died many months earlier, of a heart attack. His daughter lived in Montreal and his son had moved down from the north of France to handle things, but missed his family. After a year, he gave it up and rented the store to a ponsy shop that now sells fancy, expensive teas. 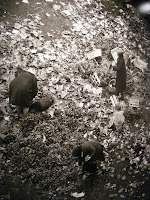 We all scramble to find our newspapers and other things elsewhere. Which is getting hard. I guess there’s not enough money in it, plus too much competition from megastores such as Carrefour and Leclerc... and shopkeepers must get tired of inventorying pencils and erasers and boxes of paperclips year in and year out. This and other such shops are probably the métiers disparus of tomorrow. And Paris will be just a touch sadder without them. *Evidently chaisières also existed in churches at one time. French churches mostly have chairs, not pews. 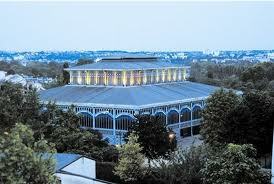 While the Ile de la Cité is the historical heart of Paris, Les Halles was its ventre - its belly - for about 800 years. 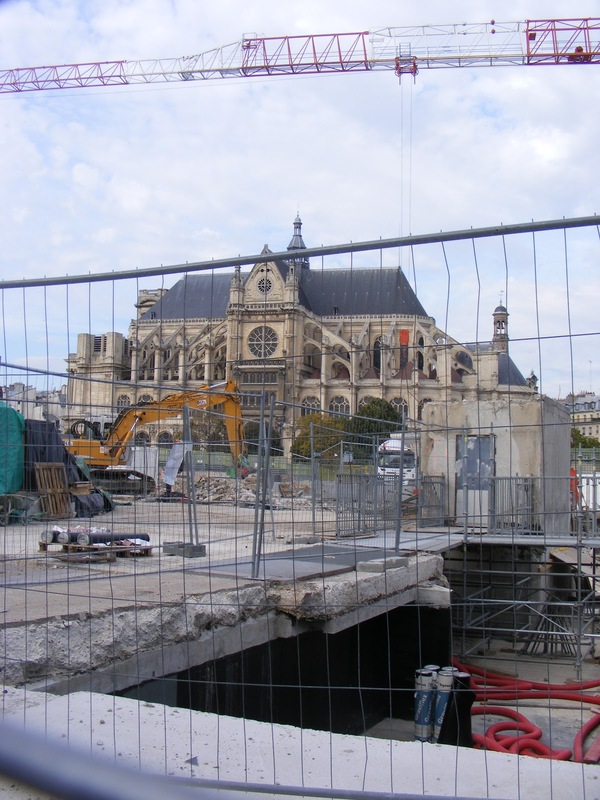 Now it’s in the process of becoming the new heart of the French capital. One reason for this is the mass transit system deep underground, at the geographic crosshairs of Paris. 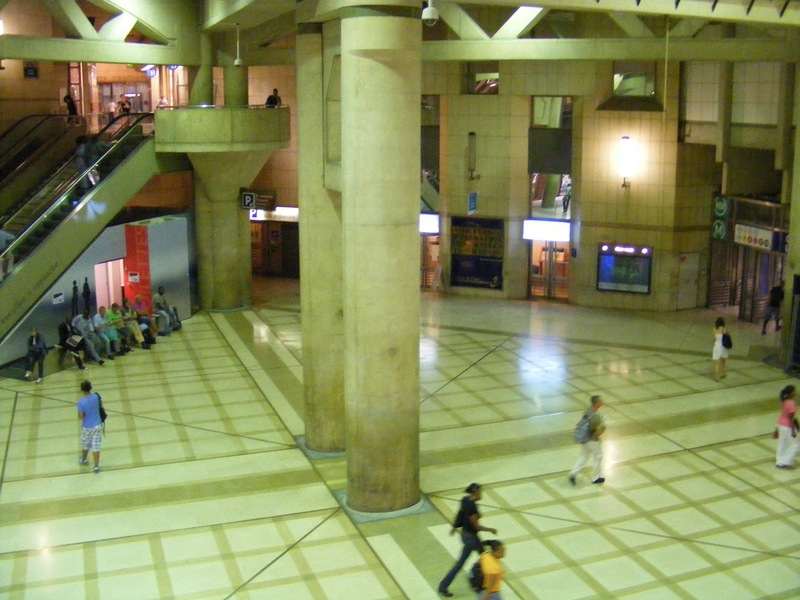 Five Métro lines and three RER regional express commuter lines cross at the Châtelet-Les-Halles station, north-to-south and east-to-west, pumping 750,000 people in and out every day. 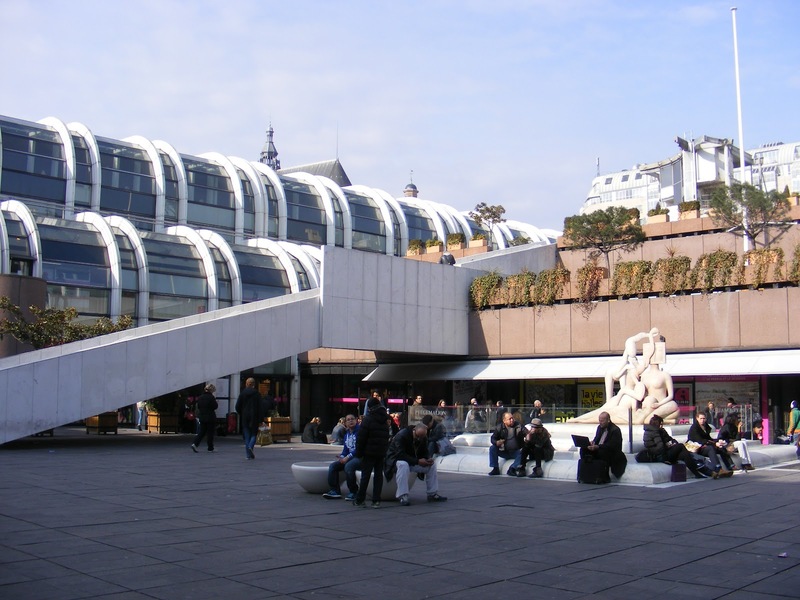 Another reason is what is already housed in the Forum des Halles under the site of Baltard’s twelve pavilions, both in the spaceship-styled multilevel section opened in 1979 and then in the second more airy and streamlined section opened in 1985. High on my list of favorites are the FNAC bookstore, where I’m able to find just about any book, CD or DVD I want, and also the 19-screen CinéCité multiplex, where you’ll often find me in the ticket line for the 10 a.m. cheap(er) show. There are many other shops of all sizes selling all sorts of merchandise to as many as 150,000 customers each day, as well as several purveyors of fast food, plus a public mediathèque with CDs in all the musical genres. There’s also an Olympic-size swimming pool across from the movie theater, with a huge picture window so people can gawk as they wait for their show to start. Miraculously, all that will remain open during the construction project, with work on the underground part taking place between 10 pm and 8 am, when businesses are closed. 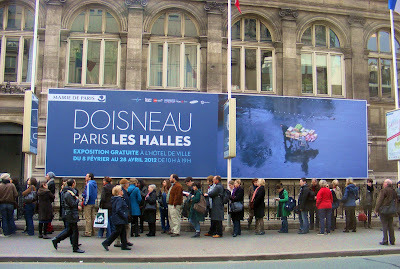 Nonetheless more than 30 years have passed since the Trou des Halles was filled, reformatting this neighborhood. While the underground part has aged relatively well, the above-ground part has not fared as well. Designed by Jean Willerval, the dated white "umbrellas" sheltering the main entrance to the Netherworld below have never been what I’d call pretty and not many people will regret their passing. I hope the jugglers, who used to gather there, will come back though. It was always good fun to take a moment and watch them practice and initiate the young to the marvels of anti-gravity. The new, much larger Canopée (canopy) that will replace the umbrella feature will be made of glass and steel. Its North Wing will house public facilities: a cultural center, a library, an auditorium, and rehearsal rooms for the arts. 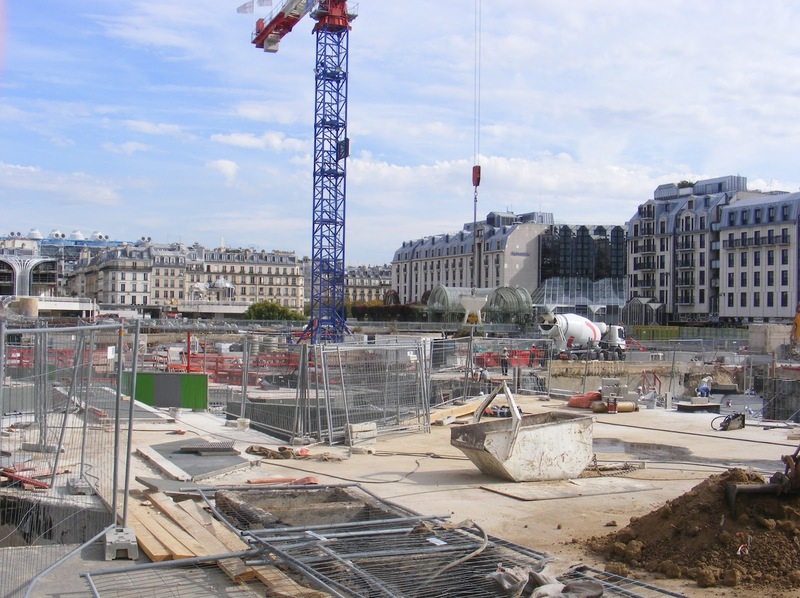 The South Wing will become a music conservatory for the four central arrondissements of Paris. The garden area will also see major changes. It was never very appealing and there were barriers that prevented people from strolling through it. You were rerouted a longer way and had to stick to graveled paths. Now it’s to be turned into trees and vast lawns where, unlike many French parks, the grass will be open to picnics and bare feet. The new project has been in development since 2002, shortly after Bertrand Delanoë, a Socialist, became mayor of Paris. 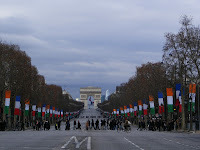 Initially, the Parisians were asked to choose between four projects. One had colored glass columns to bring light into the underground "city"; another was similar in purpose but more bizarrely geometric in shape. Fun, but neither was a good fit for the neighborhood. None of the four won over the hearts of the Parisians, so the mayor ultimately picked one: the least intrusive. Work began in 2010 and by now all of Willerval’s umbrellas are gone. That was the easy part. Now the hard part begins. 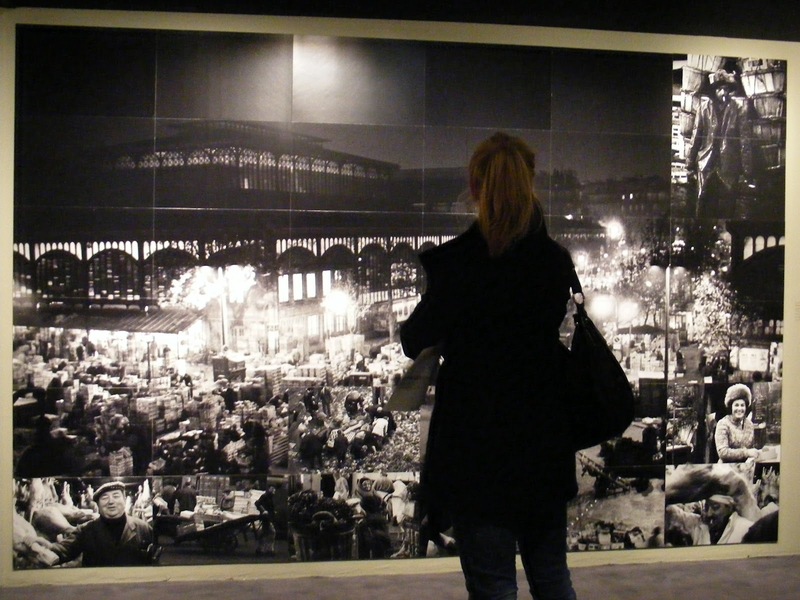 The neighborhood called Les Halles has gone through a lot of changes over its lifetime. And is undergoing yet another facelift as I write this. 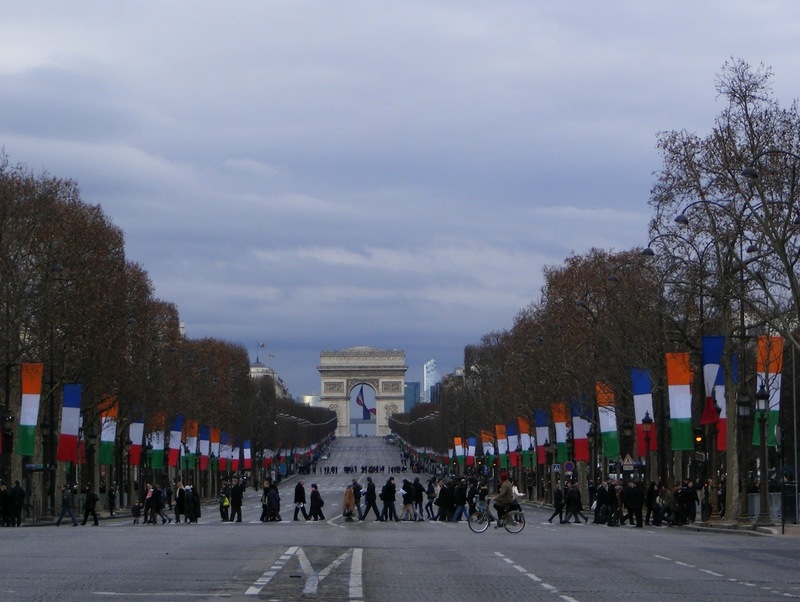 To understand what it represents to Paris, it might be helpful to go over a bit of history. In the beginning Paris was a fishing village on what is now the Ile de la Cité. 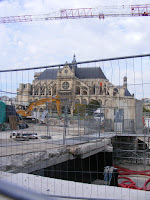 But as it grew, it spilled over onto both banks of the Seine. By the end of the first millennium, the southern bank, Rive Gauche, had focused on the Sorbonne, churches and St. Germain Abbey, all of which used Latin and that’s why it became known as the Quartier Latin. The northern bank, Rive Droite, became the commercial district, in great part because of the sandy area - the Place de Grève (grève means beach) - where boats could land to load or unload goods. Just up the banks from the beach was the central marketplace, where City Hall stands today. In 1190, King Philippe-Auguste built walls around the city to protect it from invaders such as the Vikings in the past and his Plantagenêt cousins, the kings of England, in the future. He also moved the central market to the location where it would stand for 800 years. Two covered pavilions were constructed to make the market more sanitary and from then on the district became a blend of similar pavilions and regular shops. The market came in very handy when the Louvre, part of the city’s fortifications, became the royal residence under King Charles V in the 14th century. Now that the king was in the neighborhood, it was even more important for food to be handy, for his many feasts. Gradually more and more merchants arrived to supply both the court and the ordinary citizens, and Les Halles became Zola’s Ventre de Paris, the Belly of Paris. 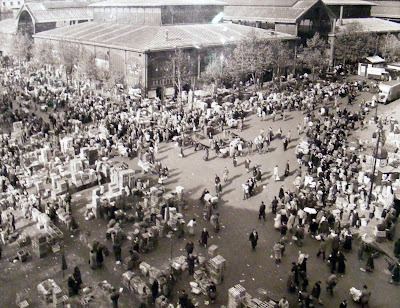 In 1969, market activities were exiled south to Rungis, near Orly Airport. The rats had to look elsewhere for their three square meals a day (see March 9 blog). 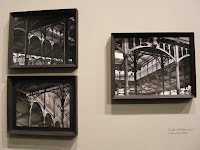 For two years, Victor Baltard’s twelve cast-iron-and-glass pavilions were used for cultural events. Then in 1971, the six eastern-most pavilions were razed to make way for the RER regional express train station and the Forum des Halles shopping center, to be built - eventually - in the huge hole called the Trou des Halles. When it was all over, only one pavilion survived: Number 8, the egg and poultry market, transferred to Nogent-sur-Marne, where it serves as a cultural center to this day. The Japanese city of Yokohama bought the upper half of one other structure. The rest was sold for scrap metal. If you wander through Les Halles today, all you’ll find left on-site is the domed Bourse de Commerce, built twenty years before the French Revolution to house offices for the police and the weights-and-measures officials on its ground floor, with huge wheat granaries on the upper level. There’s also the Fontaine des Innocents, a fountain built in 1549 and shifted slightly twice as the neighborhood evolved. And of course the transcendent Saint Eustache Church, whose construction lasted from 1532 to 1640... and which has protected the raucous souls of Les Halles throughout all of its mutations - past, present and future. 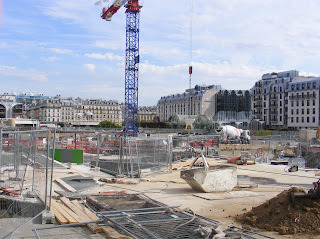 This is the third in a series about Les Halles, which is undergoing yet another total re-make. The buildings that were eventually built on the site of Baltard’s pavilions have now been torn down and a whole new concept will gradually become the new reality of this old neighborhood. 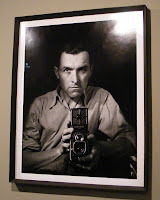 Even people who know little about photography usually recognize two names, both French: Henri Cartier-Bresson and Robert Doisneau. 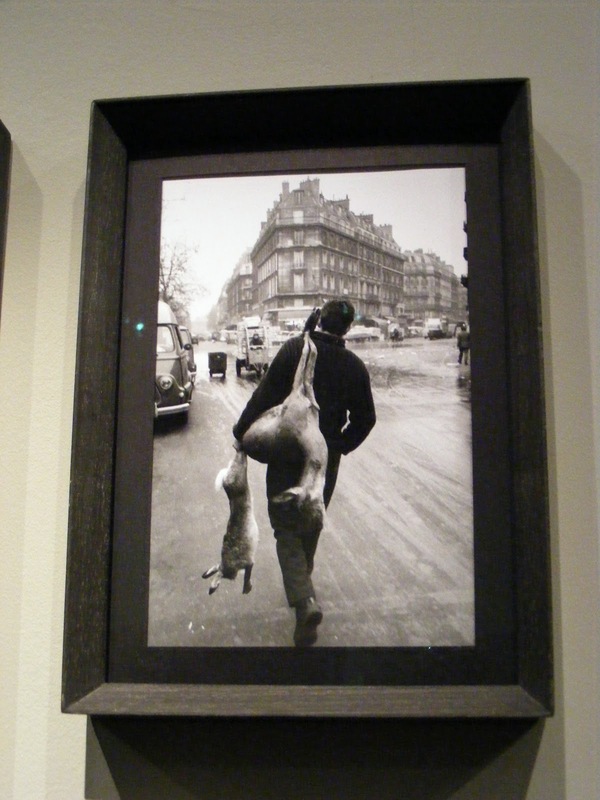 Doisneau (1912-1994) is best known for his picture everyone calls "The Kiss", Le Baiser de l’Hôtel de Ville. But at one point his interest was in the sociological aspect of photography and he is known for helping establish photojournalism. 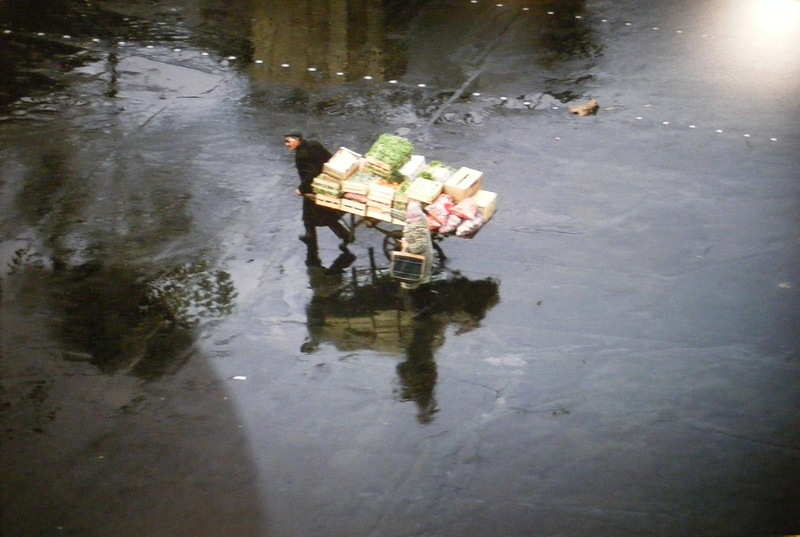 This is very obvious in his photos of the neighborhood called Les Halles, "The Belly of Paris" as Zola called it. 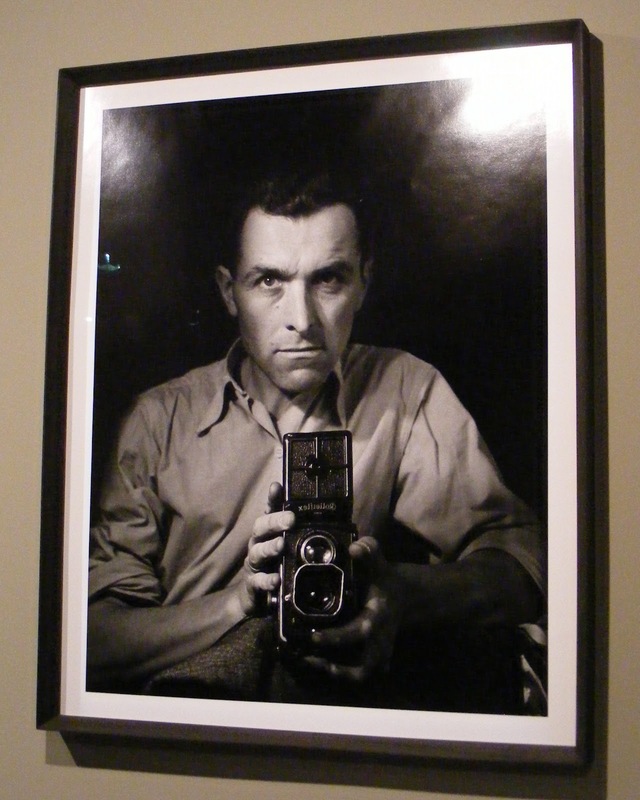 He took his first photo there in 1933 and came back time and again over a 40-year period. When the decision was made to move Les Halles to Rungis, a suburb between Paris proper and Orly Airport, and to raze the Baltard pavilions, Doisneau sensed that this was the end of an era. He took it upon himself to record it all on film, going out once a week. "I had to get up at 3 in the morning, in Montrouge [a suburb bordering on Paris to the south], to get over there in time to catch the workers who started at dawn, the guys who unloaded the trucks, the guys who set up the stalls. Hard shooting conditions: poor lighting, reflexes slowed by fatigue, so many images to choose from! And it was intimidating. But I stuck it out. I knew that it was all going to disappear. I absolutely had to capture it for the future." 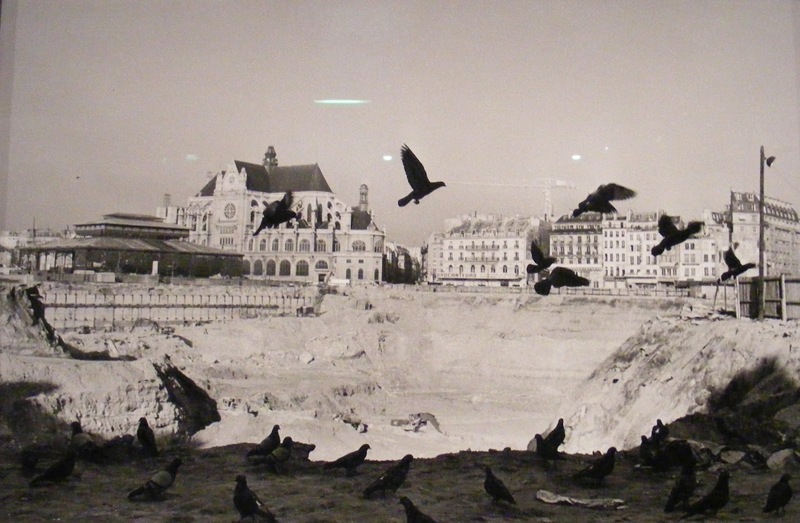 This exhibition shows all the aspects of the world Doisneau captured: the workers, the poor people who culled through the garbage left behind, the old buildings torn down, and even the new installations at Rungis. 208 photographs in all, mostly black-and-white. 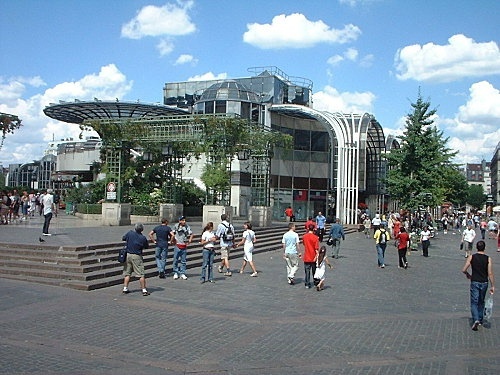 It’s aimed at people old enough to remember what it represented, what it smelled and sounded like, as well as those who never knew the graceful Baltard pavilions or Le Trou Des Halles, the gigantic hole dug for the new shopping center and then left abandoned for what seemed like years. In the words of the curator, "the exhibit shows the life, the color and the character of the neighborhood from the Thirties to the Seventies". ﻿ P.S. 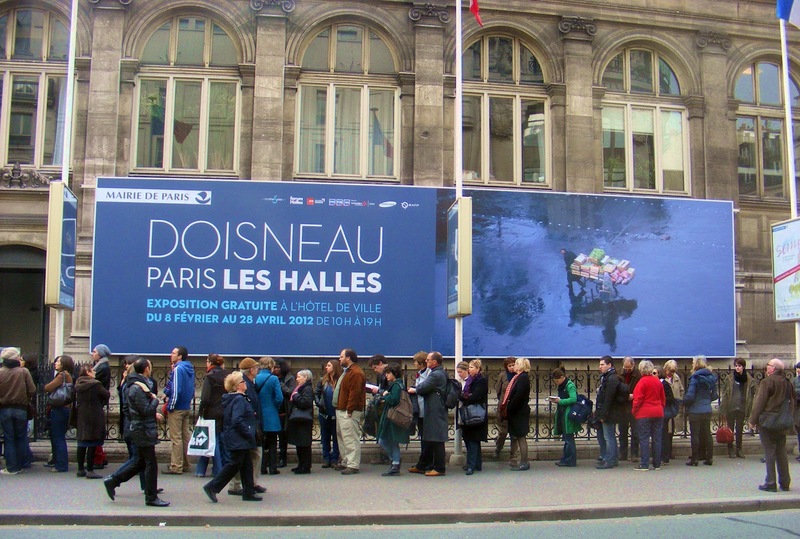 During this exhibit, photographs by Doisneau have also been put up in both Hôtel de Ville Métro stations (Lines 8 & 11). P.P.S. 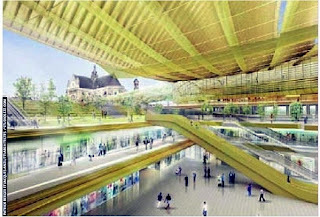 Paris Mayor Bertrand Delanoë has made it a point of honor to open up City Hall to the people. All the exhibits hosted there are free, because it’s the People’s House. And the mayor has even stepped up the rhythm, with two exhibits running simultaneously right now in two different sections of the main floor: this one on Doisneau and another one on cartoonist Sempé (see blog, Feb. 4) running until the end of March. Both have long lines, but both are well worth the wait. ﻿ There are two kinds of animals on Earth: wild ones and domesticated ones. And then there’s the rat. It’s not wild, really, but I don’t think you could say it’s been domesticated, even though rats rely on man as a source of food. I’m not talking here about the asepticized white rats that run this way and that in lab mazes all around the globe. I’m talking about your ordinary, run-of-the-mill, it-bit-my-baby rat associated with unsavory slums or abandoned buildings. The unmistakable - even in Latin - rattus, whether black (rattus rattus) or brown (rattus norvegicus... although why Norway got the honor of having the brown rat named after it, I can’t begin to tell you). The first of the twelve signs in the Chinese zodiac is the rat, which they claim is "spirited, witty, alert, delicate, adaptable and full of vitality". 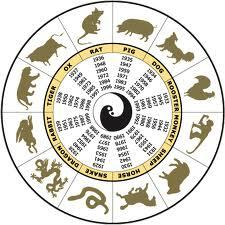 And as rats are said to have originated in Asia, maybe the Chinese are right. But for most of us, rats just symbolize unsanitary conditions and diseases such as the bubonic plague (for the latter, see Albert Camus). Personally, I’ve seen mice in one particular Paris Métro station, scurrying along the rails, scavenging for bits of food commuters let drop. But a rat I’ve never seen, even though I’m told they’re around. 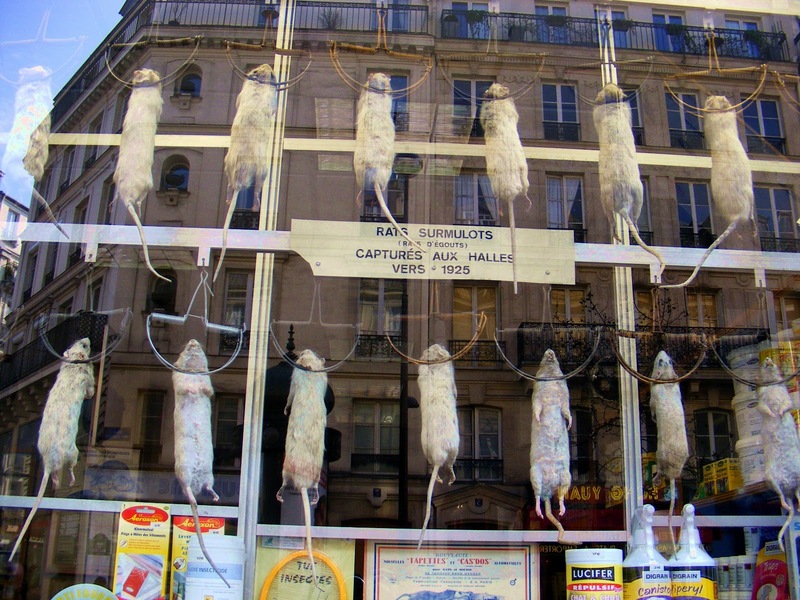 In fact, the only time there were no rats in Paris was in the freezing winter of 1870-71, when German troops surrounded Paris during the Franco-Prussian War, cutting it off from any source of food. 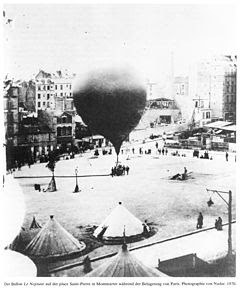 On October 7th one of the government’s ministers, Léon Gambetta, escaped in a hot-air balloon (taking off from right below what would become my home a century later) and flew over the German lines to set up a parallel government farther south. Behind him, he left two million starving Parisians who took to eating their horses, cats, dogs... even the exotic animals in the zoo. After five months, Paris capitulated, but then came the Commune (think Les Mis) and by the time that was over in May, there was reportedly not a single rat left in the entire city. Leap forward in time to General Charles de Gaulle, President of France from 1959 to 1969. As President, he lived in the Palais de l’Elysée, the White House of France. 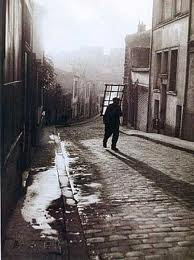 From his upstairs windows, he could look out over the graveled courtyard to the posh buildings across the Rue St. Honoré. On one of those buildings just opposite his windows was a sign that read ATTILA, Fléau des Rats - a reference to Attila the Hun being the Scourge of God. 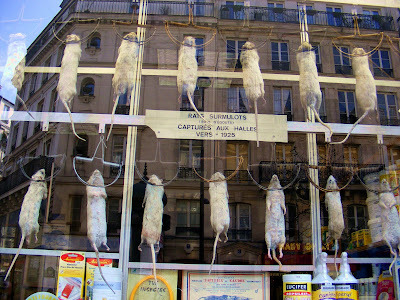 It advertised the services of an exterminator who touted himself as the Scourge of Rats, but De Gaulle is said to have felt it was personally aimed at him by a left-wing citizen. Plus he deemed it below his dignity to have this visible from his residence. He tried everything he could, legally, to make Attila move or take down the sign, but long after De Gaulle stepped down both were still there. ﻿ While still President, De Gaulle decided to do away with Les Halles, the neighborhood Emile Zola wrote of as "The Belly of Paris". It was an anachronistic bottleneck within the city, a seedy leftover of the 12th century, but a neighborhood bubbling with life as of the wee small hours of the morning. I went there with the American Embassy’s Marine Guards to buy fruit and vegetables for their barracks, because none of them spoke French. 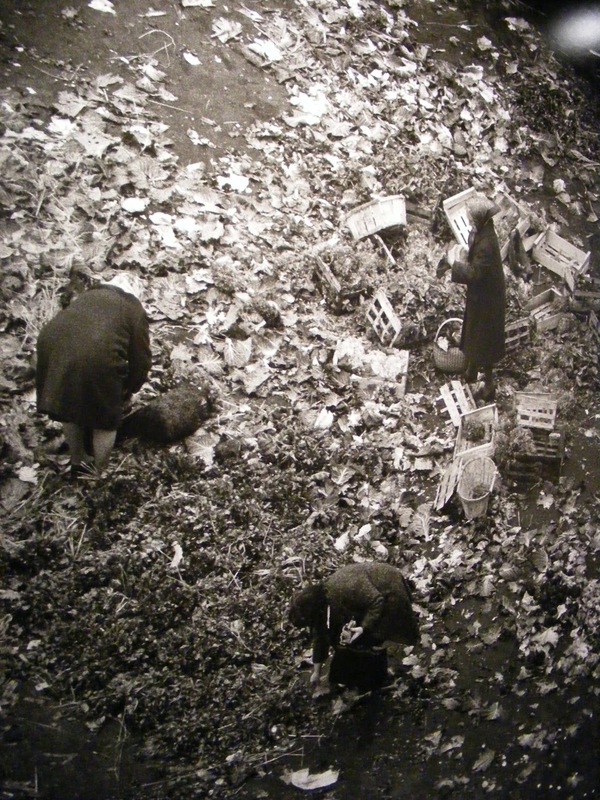 It was a fascinating place, filled with smells pleasant and unpleasant, littered with green-grocer trimmings and rejects, noisy with the calls and songs of vendors who spoke a French I hadn’t learned in school. 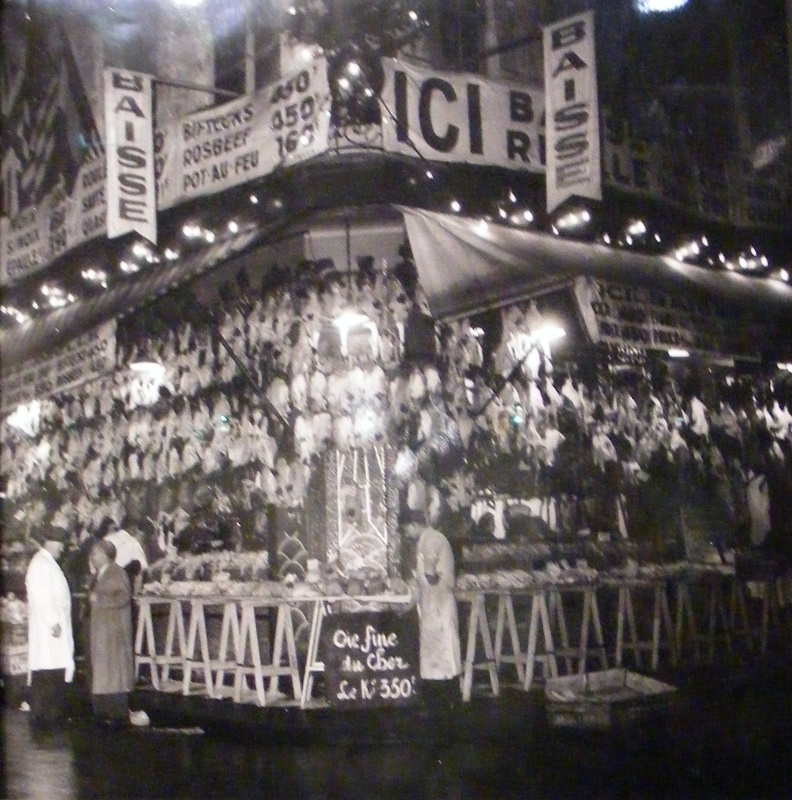 Les Halles was alive, amazingly alive, sensually alive. 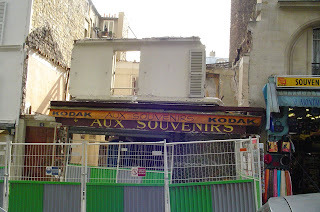 I only went there once... and then it was gone, relocated outside of Paris to Rungis, where I’m sure the vendors are happy to have a roof over their heads through summer storms and winter cold but also where any hint of folklore is totally absent. 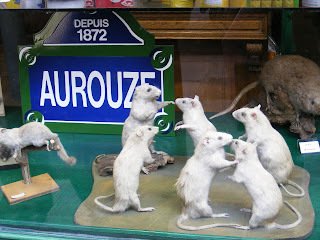 ... which, interestingly enough, was the year the rats returned to Paris after the Franco-Prussian War. And that is a bit of the history of Paris which you won’t find in the history books. This is the first in a series about Les Halles, which is undergoing yet another total re-make. The buildings that were eventually built on the site of Baltard’s pavilions have now been torn down and a whole new concept will gradually become the new reality of this old neighborhood. The building in the middle was once a dairy farm. There’s a saying: The more things change, the more they stay the same. But it doesn’t hold true for neighborhoods. Neighborhoods are more apt to say "Gone, but not forgotten". When I moved to Montmartre in 1970, it wasn’t a rich neighborhood but it wasn’t as dirt poor as when Renoir and Picasso and Juan Gris and other artists had moved in about a century earlier. Montmartre was a blend of young and old, plumbers, electricians, artisans and artists, with some famous movie, theater and music hall stars thrown into the mix. It was a true melting pot. Maybe more so, literally, than the United States. The changes were gradual at first. Then around the year 2000 the neighborhood was discovered by the bobos - the bourgeois bohème - the Beautiful People, who work so very, very hard not to look rich, right down to the designer rips in their $200 jeans. Real estate values have profited from their invasion, but a lot of the poetry is gone. Piaf wouldn’t recognize Montmartre any more if she came to sing in its streets. And when I took a walk around the other day, I had a hard time remembering what used to be where, so I started taking notes of Then and Now. Some changes are for the better. At the Place des Abbesses, there was a run-down two-story shoe store that rarely sold any shoes because the man who owned it was so unpleasant - and racist in a mixed-race neighborhood - that no one wanted to deal with him. As he owned not only the business but the building as well, he didn’t need to worry about covering rent, so he just sat inside his shop, glowering behind his display window of out-dated shoes. 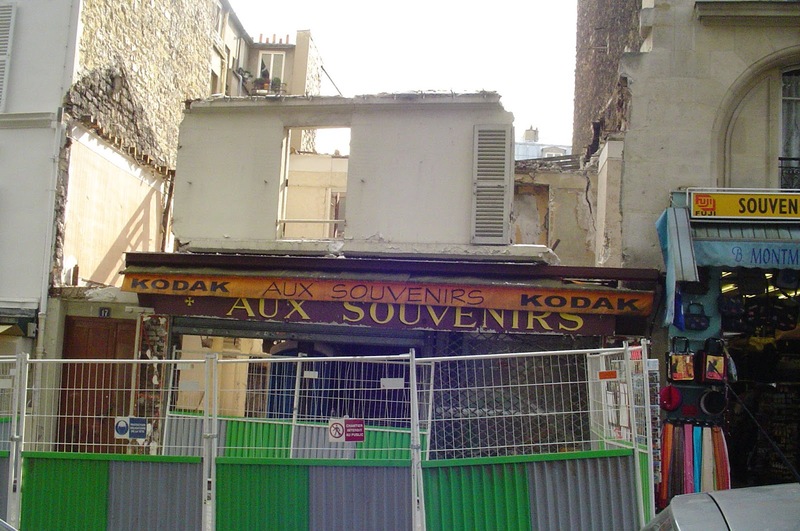 When he died, his son sold it to the City of Paris, who tore down the Dickensian shop and put up a debatably ugly Space Age neo-classic apartment building that houses in its courtyard the 400-seat Théâtre des Abbesses, which opened in 1996. A sister of the Théâtre de la Ville in the heart of town, and subsidized by the Paris City Hall, it also offers activities open to the public as well as rehearsal rooms for music and dance... an excellent thing in a neighborhood known not only for artists but also for its dancers and musicians. But most changes have followed another track. For instance, the veterinarian is now a trendy clothes shop. So is the butcher’s. There are a lot of them in the neighborhood: trendy clothes shops, souvenir or knick-knack shops, banks and real estate agencies. In fact, that’s about all that’s left. Across from Charles Dullin’s Théâtre de l’Atelier there used to be a dry cleaner; now it’s one of the real estate agencies. On the corner was a bakery, which is now a trendy clothes store. Next to it, going uphill, was a small fish monger shop run by a husband and wife; it, too, is now a trendy clothes store (is there any other kind in the neighborhood?) Across the way, the tiny mom-and-pop hairdresser-and-barbershop has been transformed into a souvenir shop. At the five-street intersection was the neighborhood bakery and a florist; now they’re respectively a café and a souvenir shop. There’s still a charcuterie (deli), previously owned by a couple whose children I watched grow up, but instead of touting delicious ready-to-eat dishes, its new owners have emblazoned the shop window with "sandwiches - paninis", aiming at a totally different audience: passing tourists. Next door, an old friend - the wine shop - is now a pizzeria. That’s one of the changes that hurt the most. I was good friends with both successive owners. The first was an ex-gymnast and that’s why my children ended up doing gymnastics in the public gym down the street (still there! 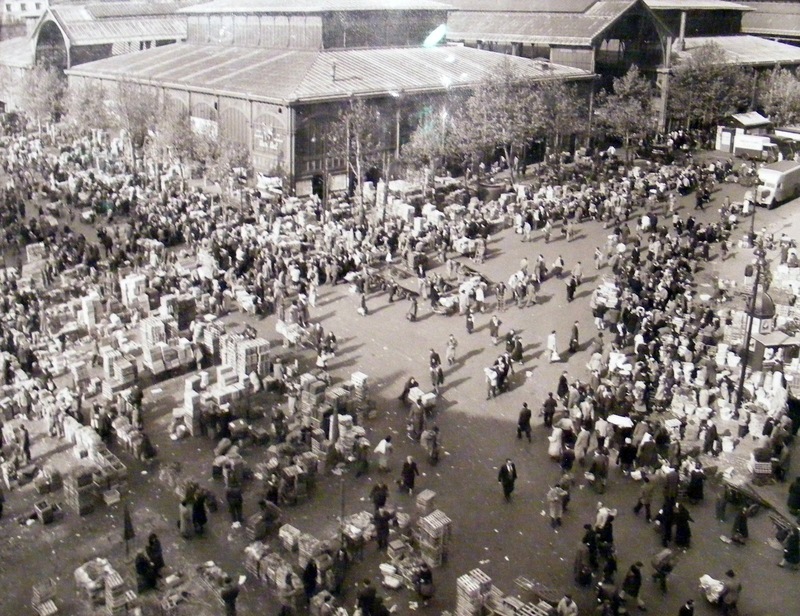 although it, in turn, had once been the local covered market). The second owner had children the same age as mine, and shared my love of sailing. This Caves de Nîmes was a daily stop, even if no wine was bought - just conversation exchanged. Headed from there back to my old place, the adjacent butcher’s shop is now a rival pizzeria. Next to it, the fur shop that was there when I moved into the neighborhood, replaced by a shop selling wonderful wooden toys and creative games, now sells tchatchkis aimed at not only passing tourists but also the resident bobos. The shop that sold the balls of wool I knit my babies’ sweaters from now sells balls... with little lightbulbs inside to decorate the stylish interiors of the bobos. The sad-eyed widow who ran that shop was the sister of the woman who ran the children’s clothes store across the way with her husband, and whose daughter became a pharmacist and worked in the pharmacie next door. I bought all my children’s "Sunday clothes" there; they were fairly expensive, but they were fashionable and well-made and lasted in such good condition that they were handed down to friends’ sons and daughters. The children’s clothes shop is now a souvenir shop, as is the pharmacie next to it, newly sold out by its Franco-Iranian pharmacist. Next was a tiny restaurant run by a man nicknamed Mickey (Mouse) and his wife Myriam. It's also now a souvenir shop - like all the other shops on that block. Mickey and Myriam lived over the shop, as did everyone in those days. (The apartment above a premises went with the shop, and that’s where you lived. No need to commute to work, unless you call a flight of stairs a commute.) I knew the three consecutive owners of the restaurant. The first couple had transformed it from a girdle shop. The second ultimately moved to a larger café back at the five-street intersection (which is still there, but under new and fancier management). During that time, an Australian friend appropriately named Bruce (see Monty Python) went down there to call for a taxi late one night, only to find the owner and his assistant - an ex-circus performer with an eye-patch whom we all knew only as Neunoeil (One-eye) - daintily massaging wine into a laughing woman’s bounteous breasts, which she had drunkenly pulled out and rested on the counter of the bar. Montmartre had a wilder night life then, and it was the only time I ever heard of Bruce being flummoxed. There were two pastry shops vying for our patronage, and I was friends with both of them. The larger belonged to Monsieur and Madame Prandy, and remained a pastry shop through two successive owners. It now sells perfumes. The smaller one belonged to Monsieur and Madame Bertheau, who retired to their native Loire region. Mr. Bertheau, who had worked since he was 14, sold his shop to provide money to retire on. He sold to a young man "just starting out in the trade" and who promised to keep it as it was, even wheedling out of them the only thing they longed to take with them: an etched glass panel depicting Millet’s L’Angélus, the name of their shop. The young man insisted that, being mounted on the wall, it was a part of the building. Sore at heart, they left it behind. After one month of work on the shop, it re-opened as... a Häagen-Dazs, with Millet’s L’Angélus presiding over it all. The "buyer" had merely been a straw man for the company, who wanted a highly profitable presence right across from Montmartre’s funiculaire. I’ve never set foot in it, and never will, no matter how hot the day, because they broke my friend’s heart and stole what was to be the couple’s pension. One good change is the shop that once sold organic fruit and vegetables - first by a dishy Québecois with a hippie red beard and then by a nice couple whose pasty complexions and stooped posture were bad advertising for the benefits organic foods could offer. It’s now an appetizing shop specializing in chocolates and macaroons, less good for your health perhaps, but oh so enticing. Bob Dylan’s The Times They Are a-Changin’ comes to mind. Or Joni Mitchell’s Big Yellow Taxi, whose refrain says "paved Paradise; put up a parking lot". I’m not really a nostalgia freak, but I do prefer when there was more variety in the neighborhood, when you could get anything you needed practically within a block or two of home or find a repairman just downstairs rather than having to call a central service that sends you out The Guy On Duty. ... when you knew the people who owned the mom-and-pop stores and you had a connection to them and their families. It was more of a true neighborhood, and the people just went upstairs when they closed up shop for dinner, instead of driving off into the night.